Really depends on location. I just sold my 1995 flareside 4wd lifted and a lot more rusty then this truck for $2500. If it runs and drives good,I would try and talk him down,but would probably pay $2500.... but everything here that old is bad rusted. 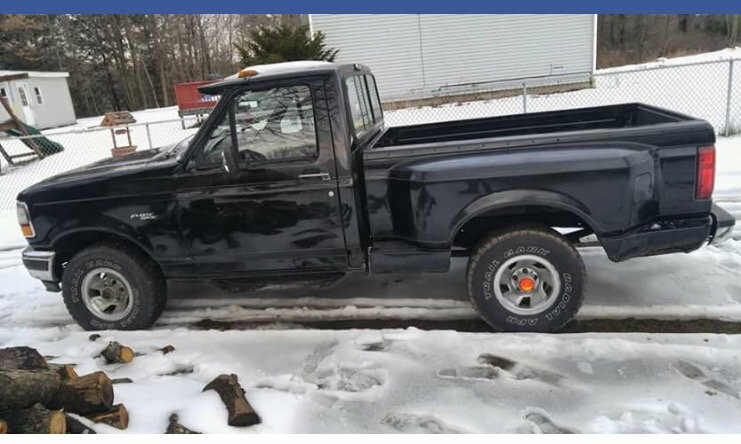 Me, being originally from New England would put a 3500 to 4500 price tag on it even more if it's a rust free truck. The plow alone would bring 1000 if it's a Fisher Minute Mount. Is that truck 4x4? I can't tell if that's a locking hub. Pending the passenger side looks as good as the drivers side, that would be a steal for a 4x4, ****** it. If it's 2wd it is priced accordingly, I would offer 2k and try to bargain from there. But if the interior looks good and it runs good, I would fork out the 2500 if he would not budge. I love a regular cab step side lifted. Alright,nice! Yeah, it's a 4wd and from NY. Does have some rust at the cab corners and rockers but not too bad. Passenger side is about the same. I offered $1800 and he accepted. Rust throws a wrinkle in it. At least you don't have to worry about the bed sides. I know it's different up there, but down here in the south, we can be a little more picky about rust because there are still plenty of these trucks around that are rust free. But that truck would still be a good deal here being 4x4. Congrats. Get to modifying! A neighbor of mine has a truck identical to it with a @6" lift and @35's. It's 302 5 speed and has a good exhaust system. It looks awesome and sounds killer. He drives it like he stole it, which makes me think, I haven't seen it in a while. Hope he didn't wreck it. That's why I specifically said bed sides. So I ended up buying it for $1700. It started right up and ran great. Drove it almost 2 hours home with no issues. Seems like a good truck but it's slow as ****. I'm assuming it has to do with the gear ratios.? What can I do to get more acceration? 1st find out what gears are in it. Was the plow on the truck driving it home? The guy, or kid I should say( was in highschool,) that I bought it from doesn't know. And no the plow wasn't on it. How do I go about finding what gears are in it? Forgive me, I'm new to this type of thing. I'm a motorcycle guy. Don't have much experience working on cars and trucks other than routine maintenance and easy fixes. See what the axle code is on the sticker in the door jamb. Look it up or post it. if it is like my 95 flareside,it has 3.07 gears...why? no damned clue. Doggy as hell with the 5.0 engine. Headers and 1.7 roller rockers helped some. If I was going to keep the truck,I had plans to swap in a 5.8 and a gear swap,but rust took over and I wasn't going to put that much money into a rusty truck. My new to me 96 f250 460 4x4 is 3 times the truck my f150 was. Doesn't struggle to accelerate,and can pull and haul at faster then snail speeds...lol. Just doesn't pass many gas stations,but it's not my daily driver,so I'm ok with that. Just doesn't pass many gas stations,but it's not my daily driver,so I'm ok with that. I was concerned about that when I was looking for my truck. I picked the 7.3. It got 19 mpg and if you wanted to stretch the truth a little 20 mpg on the highway. Checked it 3 times on a 1000 mile trip from North Carolina to Cape Cod, MA. 19 mpg! It's no bullet but with a mild programmer it goes pretty well. I'm happy! What comes to mind when you see quarts of 20/50 oil in the cab?